Ambrym (Link to Wikipedia) is one of the most amazing adventure destinations for both cultural and nature experiences. Located North of Epi, and South of Pentcost islands, Ambrym was named by Captain Cook in 1774. It means "here are yams". The massive, 1900-year-old, 12 kilometre x 8 kilometre caldera is the site of two active volcanos, Benbow and Marum. Mt Benbow last erupted in 1913, causing the evacuation of the population to Mele on Efate Island. 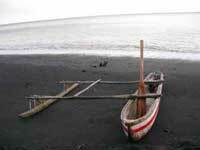 Some locals call the island "Black island" due to the black sand beaches, the ash plain, and the black magic that the people of the island used to perform. 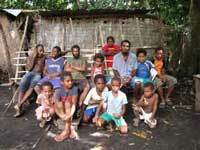 Ni-Vanuatu from other islands used to afraid of people from Ambrym when I arrived here more than 20 years ago. Treks to both Volcanoes are available from Ranvetlam in North and Craig Cove in West, and Lailinda in South. Ranvetlam is the closest to Mt Marum. It is a 5 minute drive from the airport to Craig Cove harbor, then about two hours banana boat ride to Ranvetlam and Ranon. The trek takes 2 � 3 hours from Ranvetlam to the Ash plain. Trekkers need to set up the camp, and stay over-night to visit both volcanos. The tour is usually over-night. 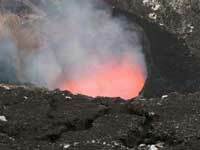 Volcano tours from North are only open from January to the end of September. People who wish not to travel by boat, or have less time, are recommended to do the volcano tour from Lailinda. Staying at Bangwere Bungalows at Ranvetlam provides the closest access to Mt Marum. 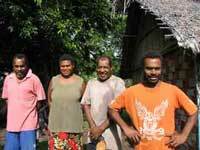 Solomon Douglas Bungalows at Ranon has the closest access to the oldest village "Fanla" (13 generations). A tour can be taken to Fanla Village to see the famous Rom dance, sand drawing, bamboo flute playing, and a magic performance at their Nasara - an area that even a visitor will sense strong spiritual influences. A stay at the village can also be arranged for the complete village experience. You can learn of their strong culture from the villagers and chiefs. They believe that some of their chiefs are clairvoyant and can see the future. 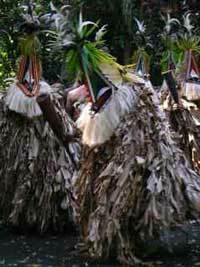 Annual festivals occur at another of the older villages, "Olal" at the Northern tip of the island. The "Magic & Yam festival" occurs in July, and the "Back to my Roots festival" in August. A village stay is available during the festival. Tours are available from both Pentecost or Craig Cove. Between April to September, the village offers a cultural day of Rom dance and magic every Thursday. We offer the best accommodation and tours available in Ambrym. Contact us for more information or bookings. About bungalow: Solomon Douglas Bungalow is situated at Ranon village, about a 2 hours & 45 minute banana-boat ride from the Craig Cove airport. Bungalow Facility: Bucket shower, bucket flush toilet. Community dining. All meals are included. Room Categories: 1 bungalow with 2 rooms on the beachfront. 4 bungalows on the hill. Activities: Tours to the volcano, Fanla village, cave, and hot springs. Other activities include wild pig hunting, wood carving demonstrations and tours to the garden. 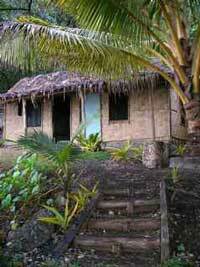 About bungalow: Bangwere Bungalows are situated at Ranvetlam village, on the top of a cliff with great ocean views. Owned and operated by Ruben and his family. Bungalow Facility: Bucket shower, flush toilet. All meals included. 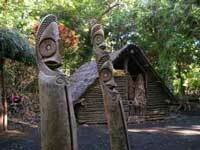 Activities: Volcano tour, rainforest tour, and Fanla village culture tour. Other activities include children's custom play. About the Village: One of the oldests village in Ambrym with 13 generations, who have strongly retained their traditional way of life with their Nasara (custom performing place). Chief Bong is their highest custom chief with a custom grade of 10. Their culture includes the Rom dance ceremony, a grade taking ceremony, custom magic, custom children play, custom chiefs, bamboo flute, carving Tam Tam carvings and various artefacts. The village is about a 40 minutes walk up hill from Ranon village. 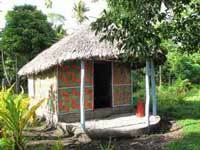 About the homestay: There is no guest house, but you can stay in the home of a village family. Activities: Rom dance performance, carving performance, magic performance, etc.